Would you recommend Hopper 3.0 to a friend? @_jacksmith The main feature that's new to Hopper 3.0 is the notification feed. The notification feed is all about bringing more personalization and discovery into the app. The app will analyze your trip watches and searches to provide personalized tips on how to snag an even better deal, like adjusting your travel dates or flying to a similar destination. And, you'll see updates on deals & exclusive sales available from your home airport. The more you interact with Hopper, the smarter it will get about learning your travel preferences and making recommendations. @fredlalonde Fred, any idea when you will provide notifications for specific flight search criteria? i.e. airline, number of stops, etc. @ausonio That is definitely one of our most requested features! It has taken us a while because our data science team has to recalculate all of the predictions based on each specific criteria. We're working on watch filters (ie. nonstops only, no low cost carriers, short layovers, etc) now though and we're hoping to have it out before the end of the summer. Love hopper. Congrats on the launch of 3.0! Love Hopper. Booked this bad boy thanks to you. Congrats on 3.0! Love Hopper for checking the best time to book but, for some reason, haven't booked a flight through it yet. Maybe I'm just used to Hipmunk. Are you seeing a lot of users like me? How do you plan to get us further down the funnel? Congrats on the update! @harryraymond Thanks for the love! When you say “users like me” are you referring to those who are used to booking on the web over mobile, or another platform over Hopper? Those may have different answers. For the first in particular, booking on mobile still seems unnatural for many because it hasn’t been done well in this industry and stats say most are used to doing this on the web. We are really committed to trying to change that however, and are striving to make flight booking on mobile something you actually want to do, and as easy as booking, say, an Uber on your phone. To do this, we’re learning from our users—so, what it would take for you to convert? DM me on Twitter or email me at pantelis@hopper.com, if you'd want to elaborate. 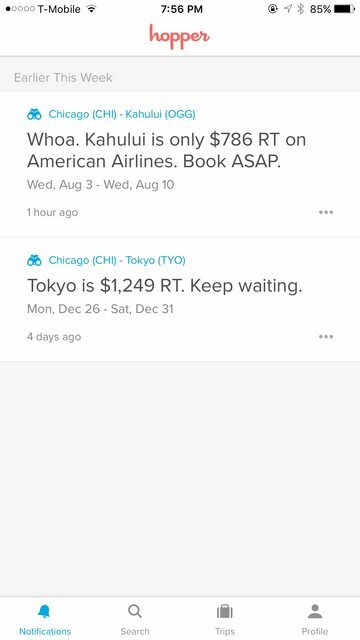 @harryraymond With that said, we are convinced we are on the right track and have one of the (if not the) fastest and easiest mobile booking flows for flights right now. We wrote about it here: https://medium.com/@hopper_trave... and we’ve already had users who have made their first flight purchases ever on mobile because of the ease of use, and the ability to book in just 4 taps if you’ve entered your information once already. We hope to build off of this to continue making it quicker and easier to enter information, reducing steps and allowing for more booking options. We think its pretty special so far and I’d love to hear what you think, if you do try it!